Larger rooms in the annex and quieter there. Attached to the Hotel is a bar, well worth sitting here at night - only thing is your all-inclusive option stops the moment you go past reception so drinks aren't free here. Mostly all of Olu Deniz shops and restaurants are situated on the strip which runs from the beach to the outskirts of the resort itself. There are some on the beach front itself. There are two supermarkets, one called Azda, and at night entertainment at various locations though it appeared that some of them did more than one performance a night - we saw a Michael Jackson impersonation group at a bar along the road whilst out walking - an hour later the same group appeared at the bar attached to our hotel. To be fair, on both occasions, they were still as lively and entertaining. It's not the most bouncing of resorts, but for us it had more than enough to merit a return visit. 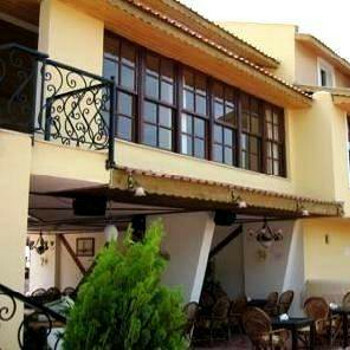 Olu Deniz is a lovely resort with many shops and bars. Ideal for family's and couples. Great beaches and lovely places to eat. I would recommend the Buzz bar; they do amazing cocktails. Jade residence if you like fish and fine dining. Famous for paragliding or sit on the front and watch them come down whilst watching the sun set! Olu Deniz is a great place for all ages . Up market with lots of restaurants , cheap food and drink . The locals do not pester you. Great for buying silver and all things fake if you cannot afford the real thing, clothes etc and the beach is amazing. There are smaller beaches and there is so much to do. Oula deniz is a beautiful place, and kept very clean, entertainment in our hotel was abismal but fine in and around the resort,beach and blue lagoon are fantastic and although we will certainly return to Oula Deniz it will only be to a five star hotel in the future. the resort was very busy and prices had slightly increased however still good value. the bean bags on the beach have been removed which is a shame but the resort still oozes class and where many people return year after year. not a resort for youngsters looking for partying . The beach was kept clean to the very highest level, even though it was always heaving with people. I liked the idea of terracotta pots to be used as bins and ashtrays instead of dumping rubbish on the beach at the end of your sunbathing. Loved the fact that you had the choice of staying by the pool, going to the beach or going to the Blue Lagoon, Sugar Beach or Sea Horse beach, all of which are worth visiting! The only thing I would advise is to buy some proper beach/sea shoes as the pebbles can be a little harsh on your feet. Olu Deniz is delightful. There are as many types of places to go as there is people. Busy loud pubs and small quaint ones, special mention to the Small House on the left hand side facing the beach just at the bit of ruin. Not the fanciest of places but the staff are so friendly,as are most of the people here. Hussein the barman does a mean dance lol. olu Deniz is famous for paragliding and I have to say that to lie on a sunbed and watch up to 20-30 of them in the sky at same time is breathtaking,soaring over the mountains that surround the resort. Ive taken a point off the beach standard purely because its stoney and sore on the feet. buy beach shoes, they are a MUST...15 lira or so (6quid)and sold everywhere. There are loads of trips and all very well priced. We went on the volcan 4 boat trip and it was amazing. We also booked with Mehmet,the first agent as you walk down from the hotel. We went to the ghost town with his company.It was brilliant. Had a lovely lunch up in the mountains, all included in the price of 13quid!! Market, harbour, lunch, ghost town and back to hotel.honestly cant beat it for value.oh and we saw a loggerhead turtle in the harbour. take your camera when they stop the bus in Fethiye after they pick you up from the market. He swam right up to the edge. amazing sight! We also walked to the Blue Lagoon, made famous in the film of same name. You pay to get in 4.90 lira then 18 lira for 2 sunbeds and a brolly for whole day and the water is amazing. like a warm bath but remember the beach shoes!! The wee cafe has great choice of foods and reasonably priced. I never really noticed litter which technically means there couldn't have been much. The Blue Lagoon was magnificent and you can hire pedalos/canoes which we did and had a great time swimming in the lagoon. It was beautiful but very busy at the shore but much quieter on the water. buy beach shoes from Azda ...as its stoney and waves very powerful. Seahorse beach is lovely and peacful . Suger and Spice was best place for food .. on sea front ... Its a small place and it nice to discover .... Enjoy I did and will be going back next year .... Weather is wonderful ..
Olu Deniz is beautiful,many bars and restaurants and local Azda (!) for cheap supermarket, which is tucked away not spoiling look of main street. Beach (bit stoney) and views are gorgeous. If you are looking for entertainment, Hissaronu (short Dolmus ride away)is best bet as Olu Deniz more laid back (ideal for us). Overall ok, hidden costs though!